As of the end of September 2018, global operational electrochemical energy storage capacity totaled 4037.6MW, or 2.3% of the total of all energy storage technologies, and an increase of 80% in comparison to the end of September 2017. In the third quarter of 2018 (July through September), global newly operational electrochemical energy storage project capacity totaled 413.9MW, an increase of 173% in comparison to 2017 Q3, and a decrease of 22% in comparison to 2018 Q2. In a geographic comparison, China showed the greatest increase in newly operational energy storage capacity, at 159.5MW, or 38% of the total, an increase of 667% in comparison to 2017 Q3 and 110% since 2018 Q2. In applications, the greatest newly operational electrochemical energy storage capacity was concentrated in grid-side projects, at 179.1MW, or 43% of the total, an increase of 1785% from 2017 Q3, and 76% since 2018 Q2. In technologies, new electrochemical energy storage projects most frequently utilized Li-ion batteries, at 374.7MW, or 91% of the total, an increase of 170% in comparison to 2017 Q3 and a decrease of 29% since 2018 Q2. 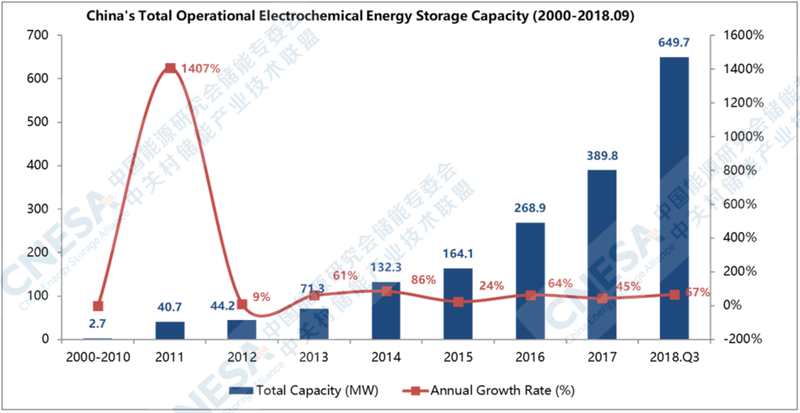 As of the end of September 2018, China’s operational electrochemical energy storage capacity totaled 649.7MW, 2.1% of the total for all of the country’s energy storage technologies, and an increase of 104% in comparison to the end of September 2017. 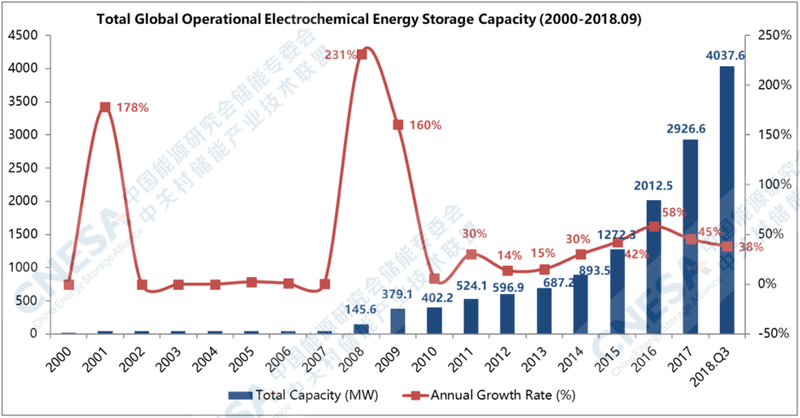 In the third quarter of 2018 (July through September), China’s newly operational electrochemical energy storage project capacity totaled 159.5MW, an increase of 697% in comparison to 2017 Q3, and 110% since 2018 Q2. In a geographic comparison, Jiangsu province showed the greatest increase in newly operational electrochemical energy storage capacity, at 111.5MW, or 70% of the total. In applications, the greatest newly operational electrochemical energy storage capacity was concentrated in grid-side projects, at 97.6MW, or 61% of the total, an increase of 100% in comparison to 2017 Q3, and 332% since 2018 Q2. In technologies, new electrochemical energy storage projects most frequently utilized Li-ion batteries, at 137.5MW, or 86% of the total, an increase of 1499% since 2017 Q3, and 86% since 2018 Q2. The full version of our quarterly Energy Storage Market Analysis report is available for purchase through CNESA’s “ES Research” platform: www.es.research.com.cn. The ES Research platform was launched in January 2018 and features a diverse range of market statistics and industry data. Sign up at www.es.research.com.cn to learn more about CNESA’s energy storage research products series.